Upon meeting fundraising goal, the University will be able to replace loans with scholarship funds in financial aid awards, building on need-blind admissions and other initiatives to make a Brown education more accessible. PROVIDENCE, R.I. [Brown University] — Fifteen years ago, Brown University made a promise to make a Brown education more accessible to students from all income backgrounds. The first step, implemented in 2003, was a need-blind admission policy, which eliminated any consideration of an applicant’s ability to pay tuition from Brown’s undergraduate admission decisions for U.S. applicants. The next major step is to eliminate loans from all undergraduate financial aid packages awarded by the University. Through a new initiative — The Brown Promise: The Future of Financial Aid at Brown — the University is working toward replacing packaged loans with grant funds that do not have to be repaid. If successful in meeting an ambitious fundraising goal by December, Brown will eliminate loans in financial aid awards for all current and incoming students starting with the 2018-19 academic year. As part of its $3 billion BrownTogether campaign launched in 2015, Brown on Wednesday, Sept. 20, kicked off a $120 million effort to raise funds specifically for this initiative, a direct response to the challenges faced by families with moderate incomes who often confront difficult financial decisions when deciding where their students should attend college. Research has shown that for many of these families, concerns about loan debt is a significant consideration even when deciding where to apply. They often do not qualify for the generous financial aid offered to low-income families by Brown and some other universities, yet also do not have the full resources to cover the cost of attending college. Brown aims to fill that gap with University scholarships in its packaged aid awards. The new initiative will require an additional $4.5 million each year for the financial aid budget — $100 million in endowed funds, plus $20 million in “current-use” funds (for use prior to income realized from investment returns on the endowment). Brown must raise $30 million prior to implementing the initiative, and the University has an ambitious goal of accomplishing this by December 2017 to be able to eliminate loans from packaged financial aid awards for all current and incoming students for the next academic year. Dean of Admission Logan Powell said the change in aid policies is the right thing to do for families. Fundraising for The Brown Promise is part of the overall $500 million goal for undergraduate financial aid set in 2015 as part of the BrownTogether campaign. The initiative builds on a series of investments in financial aid the University has made to ensure that financial considerations do not prevent talented students who qualify for admission from choosing Brown. Five years after the adoption of need-blind admissions for U.S. students, the University eliminated parent contributions for families with incomes below $60,000 and replaced loans with scholarships for students from families with incomes below $100,000. Today, Brown meets 100 percent of every undergraduate’s demonstrated financial need through grants, scholarships, loans and work/study employment. These investments in affordability have increased enrollment among students from low-income families — for example, undergraduates from families with incomes below $60,000 increased by more than 200 percent over the 10-year span (2007-08 to 2017-18) following the elimination of parent contributions in 2008. But applications from families in moderate-income brackets do not keep pace with those from other income groups, Powell said. Brown’s commitment to students from low-income families is unwavering, and “Brown is dedicated to increasing the numbers of highly talented, moderate-income students in the applicant pool to create opportunities for greater economic diversity among students,” Powell explained. Socioeconomic diversity is essential for sustaining academic excellence at Brown, Paxson said. Not only will The Brown Promise attract more of the best and brightest students to campus, it will create more freedom for them to pursue fulfilling, high-impact lives and careers rather than ones designed to repay loans. For students like Brown junior and aspiring history teacher Meghan Mozea, The Brown Promise will create more freedom for them to pursue fulfilling, high-impact lives and careers rather than ones designed to repay loans. Photo by Peter Goldberg. Brown junior and aspiring history teacher Meghan Mozea — the daughter of a Veterans Affairs nurse and a small business owner who emigrated from Nigeria — said that in choosing a college, considering whether tuition debt would be manageable on a teacher’s salary weighed on her family. Her parents encouraged her to pursue her dream of teaching, she said, but others tried to deter her. 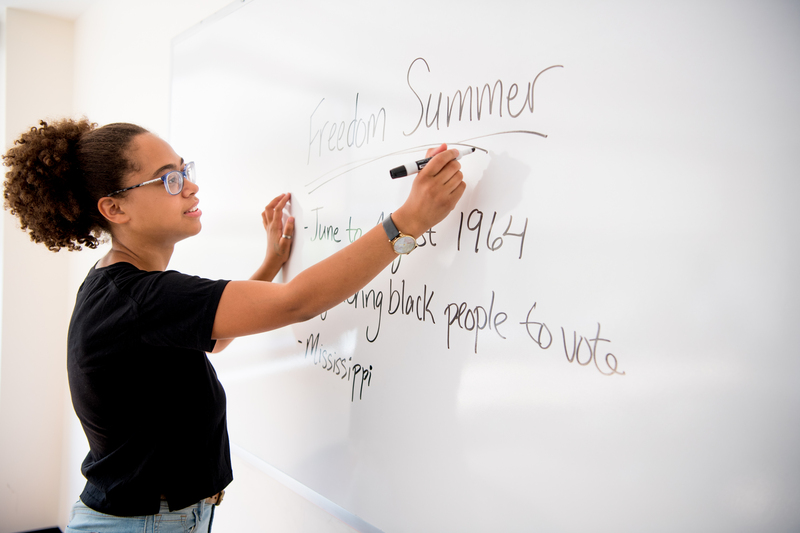 With that burden lifted, Mozea has launched into her work as a history and education studies concentrator, both in the classroom and beyond. She has mentored refugee children in Providence, tutored inmates at Rhode Island’s Adult Correctional Institute and continues to learn firsthand how to build strong teacher/student bonds. "I have been blessed to work with an incredible group of students who challenge and engage with me every day,” Mozea said. “I hope I have been able to touch their lives in a positive way, as they have touched mine." The $120 million to be raised for The Brown Promise will substitute grants for all loans packaged in Brown’s financial aid awards for students like Mozea. Upon implementation, the elimination of loans will apply to all Brown undergraduates who receive financial aid. This will include members of the incoming undergraduate class as well as enrolled undergraduates returning for subsequent years. It will apply to both domestic and international students.